6. What is your favorite breed of dog? My favorite breed is extinct. 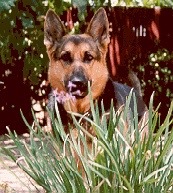 Back in the day, we had German shepherd dogs that were loyal, intelligent, healthy, and (mark this one) sane. Today, you would be very challenged, indeed, to find a Gershep that fills all these bills. In fact, I would venture to say healthy, mentally sound German shepherds no longer exist. The dog has been overbred to the point that any individual will develop one or more serious chronic ailments: hip dysplasia, hypothyroidism, pannus, megaesophagus, DM (degenerative myelopathy), osteoarthritis, several types of cancer including bone cancer and lymphoma . . . it goes on and on. Additionally, many are dog-aversive—meaning they are unsafe around other people’s animals. And some suffer a kind of mental illness—this is how a vet described it to me—in which the dog will unpredictably go in for the attack. And no, we’re not talking about dogs that have been abused. I’ve had a lot of German shepherds and loved them all, but after the last one passed on to her furry fathers, I gave up on the breed. Right now I have two corgis. For the nonce, the Pembroke Welsh corgi is pretty healthy. Don’t expect that to be a permanent state of affairs, though: unfortunately the breed is fast becoming popular, which means it also will be destroyed by irresponsible breeders. Next dog will be a Heinz-57. Preferably more than 57. This entry was posted in If You'd Asked Me... and tagged dogs on October 31, 2018 by funny. 5. Which do you prefer: Adopting/rescuing a dog or buying from a breeder? I’m pretty sure that in the future, the dogs that move into the Funny Farm with me will be rescues rather than expensively bred walking vet bills. With two exceptions — a German shepherd who came to live with us after her humans divorced and a Labrador retriever rejected by her human (an accomplished hunter) because she could not bear to harm her feathered friends, — I’ve bought dogs from breeders hoping to find animals whose personality and appearance are true to type. When a breed becomes popular, everybody and his little brother, sister, mother, father, aunt, uncle, cousin, and long-lost room-mate takes to peddling that breed. Dog breeding, done right, is not an especially lucrative enterprise, and so it soon gets done wrong. The business of producing of a very popular breed quickly becomes corrupted with questionable practices by questionable people. Some of these entrepreneurial breeders are dishonest; some are just none too bright. In either event, the result is the same: overall the breed is weakened and its representatives take on inbred physical ailments and psychological quirks that will cost you money, will make the resulting animals’ lives short and miserable, and can put people at risk. And that is to say nothing of the grief you will experience in dealing with a dog that is unsound. Because dog breeding is not especially profitable, people charge ridiculous amounts for the offspring of a pair of dogs for which they themselves paid way too much. A thousand bucks for an allegedly pure-bred puppy? That is effin’ CRAZY! It’s also typical. And it’s also just the start, because many pure-bred dogs are actually inbred and overbred, the result being that they are walking vet bills. While there’s no guarantee that a Heinz-57 pooch will not run up some handsome vet bills, too, your chances of getting a pure-bred dog that will remain healthy for most of its natural lifespan drop dramatically in lock-step with the popularity of the breed. A dog is…well, a dog. Doesn’t matter what kind of dog it is. It’s a dog. Why should you go off the deep end to acquire a dog whose genes have been artificially manipulated to make it look this way or that way? Is that even a moral thing to do? One could argue, fairly convincingly, that it is not. Some so-called breeders are not really breeders in the sense of ethical people who are in the business of producing a small number of the best and healthiest dogs possible. Some are actually in the puppy-mill business, cranking out pups as fast as the dam and sire can produce them. Many times these puppies are the offspring of a parent bred back to a grandparent or a cousin, a practice guaranteed to pass health and temperament faults forward. Personally, I have had a series of experiences with breeders who indulged in various minor dishonesties and larcenies. With just one exception, most of them misrepresented their practices in one way or another. One woman actually told my son that his monorchid dog’s testicles would descend when the pup was about six months old. (Look it up: it’s not hard to get to the bottom of that…uhm…misapprehension.) Fortunately he was able to force her to pay the bill for the VERY expensive surgery required to remove the wandering balls, but only because we had pushed her into a sales contract that guaranteed she’d cover expenses having to do with inbred unsoundness. That same dog is so neurotic it can not be carried in an automobile, because it will work itself into such a tizzy that it becomes hyperthermic. Just driving the dog across town to the vet can put the animal’s life at risk. 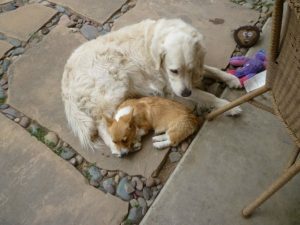 Between the time I snagged my first corgi from the dog pound and the time I decided to get a second one, the breed suddenly got “noticed.” The pup that I bought, while a nice enough little dog and healthy enough (so far), is the most neurotic critter I’ve had this side of my mother’s wacky Chihuahua. Neurotic dogs can, in some circumstances, be cute…but they are invariably a challenge to train and manage. More to the point, though: the difference between a typical representative of the breed from BEFORE it became popular and one from AFTER popularity is striking. That alone, even without the other three issues enumerated above, is a good reason to avoid buying from a breeder. My next dog is coming from the dog pound. This entry was posted in If You'd Asked Me... and tagged dog breeders, dog overbreeding, dog rescue, dogs on September 26, 2018 by funny. 4. 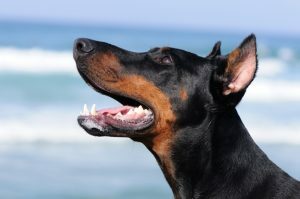 What are Doberman Pinschers like to own? They’re good dogs if you’re fairly affluent and have some skill at training. I loved my dobe: he was quiet, patient, and loving. It’s worth knowing that these dogs can be walking vet bills. 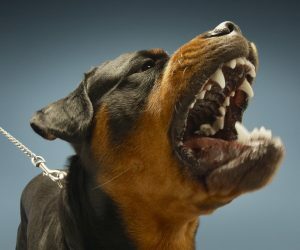 Like all breeds that have gone through periods of popularity (they’re coveted as supposed “guard dogs” and among gang members for dog-fighting or simply to project a macho image), they are overbred and so suffer a number of genetic problems. Ask the breeder about hip problems, eye problems, and skin problems. To give you an idea, one resource considers hip dysplasia, osteosarcoma, von Willebrand’s disease, and gastric torsion to be “minor”(!) problems. Major problems include Wobbler’s syndrome, cervical vertebral instability (CVI), and cardiomyopathy. These are expensive, often painful, and ultimately likely to be fatal diseases. Find out if the breeder has had genetic tests done on the parent dogs . . . and good luck with that. . . .
To maintain health and avoid behavioral issues, dobermans need daily physical exercise. Please: even if you are in the US, do not have your pup’s ears cropped and do not let the breeder do it for you. Your breeder will tell you poo-poo, ’tis nothing. But that is not true. It’s a cruel procedure that can take weeks to months for the pup to recover from and whose only purpose is a foolish idea of cosmetic beauty. In some countries it’s illegal, as it should be in the United States. This entry was posted in If You'd Asked Me... and tagged doberman pinschers, dogs, guard dogs, pets on September 21, 2018 by funny.